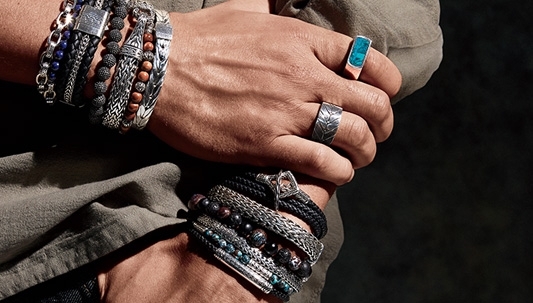 Embrace men’s Bali style, no matter where you roam, with the eclectic artisan designs of John Hardy’s jewelry collection for men. Emblemize your style with the Bedeg Silver Band: a placid exterior of three sterling silver layers concealing an expressive inner ring marked by etchings that summon tribal traditions of carving and tattooing. Keep it casual yet cool with a John Hardy mens bracelet. Brighten things up as you wear the Palu Silver & Bronze Geometric Band—a piece that’s sure to pair well with glinting sunlight. Bold color and bold design are yours in the Naga collection for men, where you can find pieces adorned by silver dragons against a backdrop of brilliant blue beads. Make a quieter statement with pieces like the bamboo-shaped Batu Black Sapphire Cross Pendant—a potent symbol of forest and faith. Whether you’re looking for rings, bracelets or chains, John Hardy craftsmanship continues to set the bar for men’s style and accessories.